We’ve all been there, walking the aisles of the store or browsing online when a compelling message pops up saying “Buy this product and make a difference!” Before you know it you’ve got a lifetime supply of dish soap to help oil-spill affected animals and everyone’s getting pink dish towels for Christmas because Breast Cancer needs a cure. You can’t remember why you were shopping in the first place, but it sure feels good to know you’re doing your part! 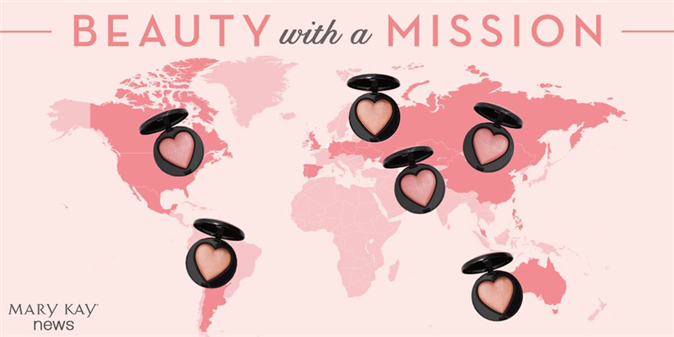 Mary Kay’s Beauty That Counts® program is a lot like that - buy the limited edition selected product, apply and admire your new gorgeous shade, hit the town with confidence knowing you made a difference in someone’s life. Win-win, right? Since its launch in 2008, the Beauty That Counts® program has donated millions of dollars to worthy organizations from Hong Kong to Russia and everywhere in between helping victims of domestic violence, educating teen mothers, providing food for underprivileged children, bringing comfort to cancer patients, and so much more. Here in the US, Mary Kay donates $1 from each Beauty That Counts item sold toward The Mary Kay Foundation’s efforts to bring an end to domestic violence through their shelter grants program. This provides critical support, shelter and confidence for survivors of domestic violence. Curious how the Beauty That Counts program provides life-changing support around the world? Some of our global markets shared how their Beauty That Counts partners and efforts are making a difference in their communities. Get your blush brush ready for this year’s limited edition Baked Cheek Powder offered in two shades - Kind Heart and Giving Heart. To learn more about the Beauty That Counts program and global beneficiaries, visit the Beauty That Counts page.